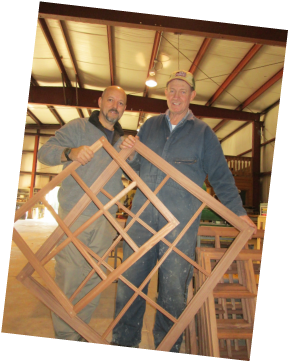 Welcome to Travis Creek Wood Products , supplier and distributor of fine domestic and exotic wood products for various applications. When you contact Travis Creek you will reach either Tim or Tom. Tim Spruill, Millwright, oversees all operations. Each job is handled as though it is our only job and you can expect personalized service from start to finish. Tom Kilian, Product designer and Woodwright tunes each order to please the client. Need a variation on the normal? You can be assured that your specifications are reviewed for your particular fabrication. Designers love us because we speak their language, Engineers appreciate our seasoned ability to read and decipher mechanical drawings making the impossible possible. Contractors and installers welcome our onsite delivery and flexibility of "in shop" services such as cutting to specified lengths and providing specific sizing and turn key supply options. HISTORIC PROPERTIES OF SOMERSET PLANTATION, HISTORIC HALIFAX. Among core products of Cypress, Juniper and Shou Sugi Ban , we offer specialty wood and moulding products. Custom mouldings in your choice of more than 100 different wood species both domestic and exotic. Choose from our line of over 100 existing profiles. We can also custom manufacture any profile to meet your specification. We strive to meet your needs, and help make your job easier. Travis Creek is your total trim package company as well as a supplier of decking and exterior siding and lumber . Leading architects and designers specify our mouldings when they demand quality, variety, versatility, and the ability to duplicate.